FOR a variety of reasons particular interest centres round the four big extreme clipper ships which Donald Mackay, the great Scottish-American shipbuilder, built for James Baines of Liverpool at the beginning of the Australian gold rush. These were the Lightning, the Champion of the Seas, the James Baines and the Donald Mackay. Of all these the Lightning is the most interesting, because of her performance and history. The discovery of gold in California in 1849 gave the first great chance to the extreme American clippers. They carried the adventurous gold-seekers in their thousands round the Horn and made enough out of them to come back by any route, often via China with a cargo of tea. In the same year the repeal of the British Navigation Acts, which had prohibited the carriage of British imports in any ships but those flying the British flag or the flag of the country of origin, gave these lofty ships their chance. They entered the British trade from the Far East, where they created a sensation, and for the time being skimmed the cream of the business. The British builders soon learned to turn out ships as good as the Americans, but there had been no time for this influence to be felt when gold was discovered in Australia in 1850. News travelled slowly in those days, and first reports were always suspect. It was not until the following year that the adventurous Briton learned that he had just the same chance of immense profit under the Union Jack as he had under the Stars and Stripes. Passenger accommodation to Australia, no matter how rough and uncomfort-able as long as the ships were fast, was immediately at a premium. Until then the Australian trade had, with a few exceptions, employed only second-rate ships. There were a few fine frigates flying the Dunbar, Green, Wigram or Aberdeen flags; but the majority of these preferred to trade to India and the East. GRACEFULLY RIDING THE SEAS. For may years the Lightning’s career, after her maiden voyage from Liverpool to Melbourne in 1854, was a record of fast passages. The Lightning had two complete decks and a poop. The ‘tween deck, designed for the transport of emigrants, was unusually spacious. She had four big state rooms, whose furnishing and comfort were then unparalleled, and accommodation for second-class passengers. For over then years the Lightning served successfully - almost without a break - on the Liverpool-Melbourne route. In 1869 she was destroyed by fire. James Baines was one of the first shipowners to take advantage of the rush. He was a young man, the son of a widow who was content to keep a small sweet-shop in Liverpool, but he had already begun to make a name for himself among hard-headed Merseyside business men. He obtained sufficient backing to buy a vessel which had been built in British North America and sent over to Britain for sale cheap and on long credit. With her he did well enough to buy the famous Marco Polo and to start the Black Ball Line - not to be confounded with the Black Ball Line of clipper packets that ran across the Atlantic, and with which Baines had no connexion. The profits of Baines’s enterprise and the reputation that he made with his early ships soon put him into a position to order new tonnage of the finest type on the market. By then the China clipper had been developed into a magnificent little vessel; but she was designed entirely for the tea trade and possessed many features which, in Baines’s shrewd opinion, did not fit her too well for the Australian trade as it then existed. He wanted something more resembling the extreme clippers that the shipyards of New England were building for the Californian trade. These were bigger ships than the China clippers, and had fine hulls that were still sufficiently spacious - for a large number of emigrants and for the water supplies which were always their greatest problem. Believing in the best, Baines went to Donald Mackay in 1853 with a contract for four of the finest ships that he could build. The Lightning was the first vessel to be designed and built in the United States for English owners since the War of Independence. It may be taken for granted that a man with as much pride in his work as Donald Mackay would be spurred to his greatest efforts by this fact. The Lightning’s dimensions were 244 feet overall by a beam of 44 by 23 feet depth of hold, giving her a registered tonnage of 1,468 by what was then called the “new British measurement”. This is still in force. The New England States were then producing magnificent shipbuilding timber, and Mackay chose the best. All the knees in the hold, hooks and pointers were of selected white oak, well seasoned, the knees in the ’tween decks were hackmatack (American larch). Hard pine was used for the scantlings and for the lower deck; the upper deck was of white pine. Iron and copper bolts were used for the fastenings, of 1-in or 1¼-in diameter, and special care was taken to provide sufficient strength in the fine ends, which had four tiers of uprights bound to the keel and keelsons by massive oak knees. The fore lowermast was 86 ft long by 37-in diameter, the fore topmast 46 ft by 18½-in, the fore topgallant mast 23 ft by 12½-in and the fore royal 15 ft by 10½-in. On the mainmast the respective sections were 90 ft by 38 in, 50 ft by 19½ in, 23 ft by 14½-in and 15 ft by 11½ in. The skysail mast, fitted on the main only, was 13 ft by 8½ in. In the mizen the four sections were 79 ft by 30-in, 40 ft by 15½-in, 18 ft by 11½-in, and 13 ft by 8½-in. Hard pine was used for the masts and bowsprit, in the topmast and jib-booms plain, but in the lower mast and bowsprit dowelled together and bolted, with additional strength from iron hoops. 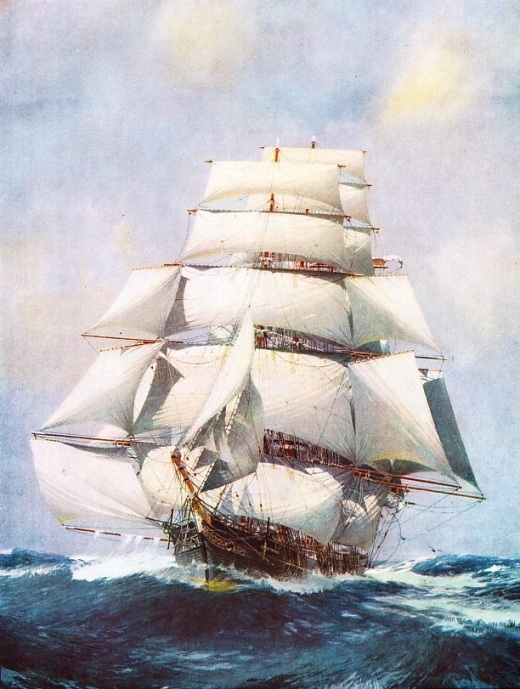 Russian hemp was used for the standing rigging, but the running rigging was mostly of Manila, which was something of a novelty in British ships. The sails were of cotton canvas, snow-white and with the perfect set in which the Americans took such pride. The Lightning had two complete decks and a poop, the poop being later extended forward to give better accommodation by linking up with the big midship house and the topgallant forecastle. The ’tween decks, designed principally for the carriage of emigrants, had a head-room of 8 feet, which was unheard of in that day. There were 7 feet of head-room in the cuddy, which was 34 feet long by 12 feet wide, with four big state rooms leading out of it. Its furnishing was regarded as the last word in luxury at sea. The midship house offered accommodation for the second-class passengers, their quarters being 36 feet long and fitted with a five-foot alleyway down the centre with six state rooms on either side. Forward of this was the galley. On the Australian run a fast ship could always reckon on doubling her crew for the outward journey by permitting men to work their passage to the goldfields. The crew was housed in a big topgallant forecastle extending to the fore rigging. An innovation was the provision of three gangways connecting this forecastle with the midship house and with the poop, so that the men could pass from end to end of the ship at their work without having to go down into the waist. This was constantly under water, because of the ship’s lines and the way she was driven. Over the wheel a relatively big house was built, partly to give protection to the helmsman when she was running her easting down, partly to provide a smoke room - a luxury not yet introduced on to the Atlantic - and partly to protect the companion-way on the star-board side which, led down to the captain’s and passengers’ accommodation under the poop. On either side of the ’tween decks, which were fitted for the steerage passengers, there were ten plate-glass port-holes, in addition to skylights and ventilators on a scale that had never been dreamed of before. In the waist the bulwarks were 7 feet high, the poop being flush with their rails and protected by a rail on turned mahogany stanchions. When the Lightning arrived at Liverpool her lines were greatly admired. She was declared to be one of the smartest ships known, with the most daringly hollow bow ever conceived. James Baines carried out a number of improvements in the accommodation and, after a short experience, the rig was slightly altered. Instead of being a three-skysail-yard ship she was rigged with a moonsail over her main skysail, a small spread of light canvas which was of doubtful utility and loathed by every sailor. Captain “Bully” Forbes, who had made such a name in the Marco Polo, was appointed to the command of the Lightning. He superintended the final touches in Mackay’s yard at East Boston; and when she was ready for sea she was loaded for Enoch Train’s clipper line to Liverpool. 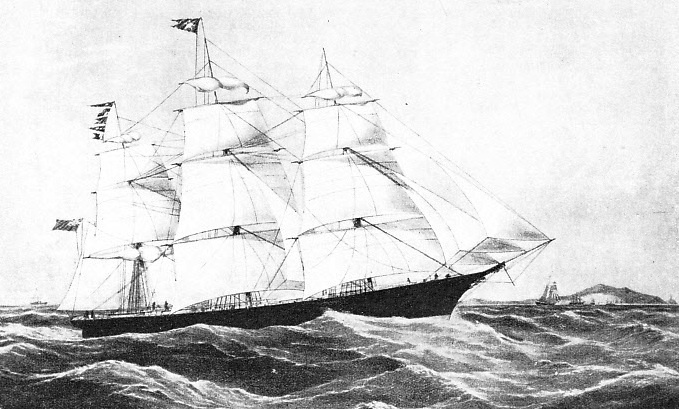 Captain Lauchlan McKay, the younger brother of her builder and himself a clipper ship master with a high reputation, accompanied Forbes on the run across the Atlantic. As the Red Jacket, built for Pilkington and Wilson’s rival White Star Line to Australia, was booked to sail from New York on the day after the Lightning was due to leave Boston, everybody was anxious that the Lightning should do her best. She certainly did, for the run from Boston Light to Liverpool was made in thirteen days nineteen and a half hours, her best day’s run being 436 miles - about a hundred miles better than the best day’s run hitherto logged by a steamer. The Red Jacket did the run from Sandy Hook to Liverpool in thirteen days one hour, with a best day’s run of 413 miles, so that both ships started with a preliminary advertisement that was worth much on the Australian trade. But even James Baines lost his nerve when he saw the Lightning’s hollow bow lines. He had them filled in to a certain extent with slabs of oak, much to the disgust of the Americans. Mackay was right, however, for when one of these slabs washed away, the other was removed, and she was certainly the better ship for their loss. In May, 1854, the Lightning left Liverpool on her maiden voyage to Melbourne with a good crowd of passengers. “Bully” Forbes had as mate “Bully” Bragg, who was nearly as notorious as his captain. The voyage out was made in seventy-seven days, 348 miles being the best day’s run. The ship was thus well advertised for the return passage, for which she booked eighty passengers and, as far as can be ascertained, about £1,000,000 worth of gold dust. It is often difficult to discover just how much gold dust these returning clippers carried, for there were plenty of bad characters in the Australian ports and every precaution had to be taken against the risk of piracy. THE LIGHTNING was ordered in 1853 by James Baines for the Black Ball Line from Donald Mackay, the great Scottish-American shipbuilder. Laid down at East Boston; this clipper, which was to prove herself one of the fastest ever launched, had a registered tonnage of 1,468, an overall length of 244 feet, a beam of 44 feet, and a depth of hold of 23 feet. The Lightning made the homeward run in sixty-four days three hours ten minutes - a record for all time - and she handsomely beat the Red Jacket with a round voyage time of only five months eight days twenty-one hours, just under three weeks of which were spent in port. “Bully” Forbes then left her for the Schomberg, which he was to wreck on her maiden voyage with his own career. He was succeeded by Captain Enright, one of the finest master mariners on the Australian trade. A Scandinavian by extraction, he was in many ways the direct opposite of Forbes. He had no belief in bad language or manhandling a crew. Boasting was foreign to his nature. He conducted Divine Service, to which he welcomed his forecastle hands as well as the passengers; he ran his ship with strict decorum and encouraged such amusements as the publication of a really excellent little ship’s paper, copies of which are now rare and keenly sought by collectors. 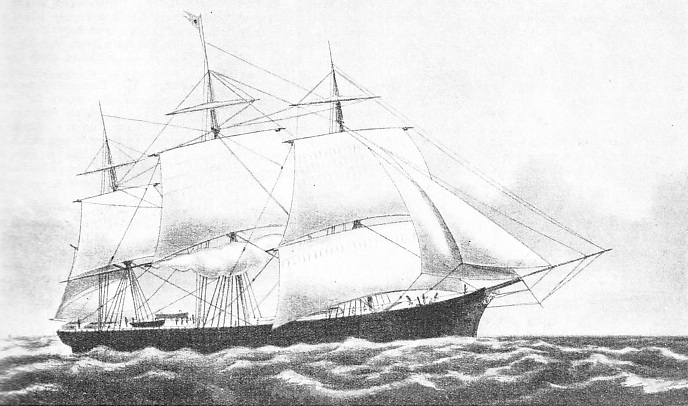 Under Captain Enright the Lightning sailed from Liverpool in January, 1855, with over 700 passengers. Another good passage, with a best day’s run of 390 miles, increased her reputation in Australia, and she left for Liverpool with a few passengers and over 69,000 ounces of gold. Her passage to Queenstown wras sixty-eight days. After that the Lightning’s career for some years was almost a catalogue of fast passages. Outward-bound in 1856, she ran 2,188 miles in seven consecutive days, and homeward-bound she had 140,000 ounces of gold. stores and ammunition in the Thames, where she was thrown open to public inspection. She was greatly admired. Captain Byrne now took over the Lightning. The new captain probably did as well as his distinguished predecessor could have done, for the Lightning made the passage from Portsmouth to the Sand Heads - off the mouth of the Hooghly River - in eighty-seven days, a better performance than any other sailing or auxiliary steam transport. The situation in India was then so serious, and mounted troops were so badly needed, that the Lightning was given a great reception. This famous ship then returned to the regular Liverpool-Melbourne run, the only break being in 1862 when, in company with the Blue Jacket and the Red Jacket, she made a special trip from Melbourne to Port Chalmers (New Zealand) for the first rush to the Gabriel’s Gully Goldfield. Near Port Phillip (Victoria) on this voyage, while in charge of the pilot, she grounded on two shoals near the fairway. In 1866 the Lightning, with the Champion of the Seas, was sold to Thomas Harrison of Liverpool. In October, 1869, while the Lightning was loading wool at Geelong (Victoria), her cargo caught fire and she had to be sunk. A RIVAL IN SPEED to the famous Lightning was the Red Jacket. This ship - shown above - was built about the same time for a rival company. The Red Jacket sailed across the Atlantic from Sandy Hook to Liverpool in thirteen days one hour, with a best day’s run of 413 miles. Despite this excellent performance, the Lightning beat her on a round voyage between Liverpool and Melbourne, making the homeward run in just over sixty-four days The Red Jacket had three decks and was a vessel of 2,072 gross tons. She was built in 1853 and her measurements were 251.2 feet by 44 feet by 31 feet.